Discovery Cove tips and tricks! Discovery Cove is a tranquil paradise that offers the perfect break in-between exploring the Florida theme parks. The park only admits 1,300 guests per day, which means that it’s never overcrowded, and you’ll be able to totally relax. This is also why it’s so important to book your Discovery Cove tickets in advance because with a limited number of guests allowed in each day, you don’t want to miss out. 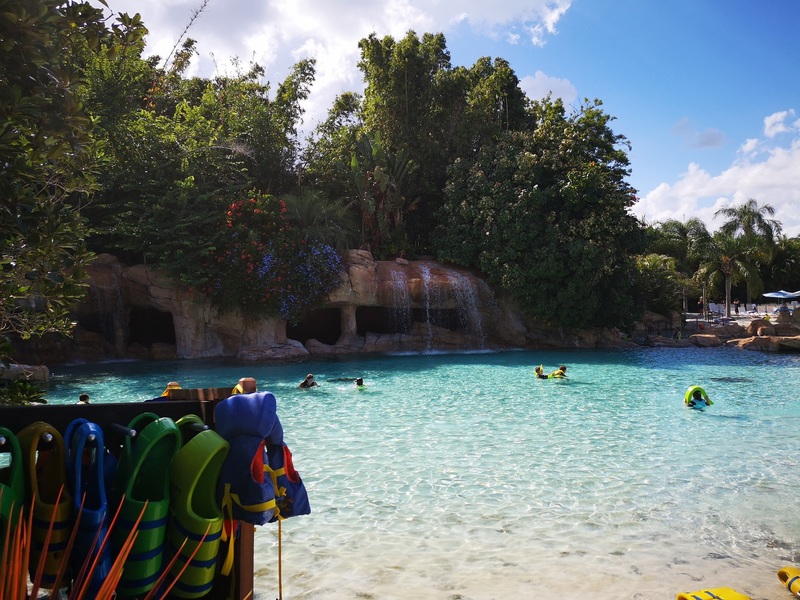 It’s so important to arrive early so that you can make the most of your day at Discovery Cove. There’s so much to see and do and arriving early means you won’t have to rush to fit everything in. Plus, if you arrive early, you’ll also be able to get a great spot on the beach. One of the best things about Discovery Cove (apart from the white sandy beach, amazing animals, lazy river- should we go on?) is that it’s an all-inclusive resort. You’ll be able to enjoy a complimentary breakfast and lunch, plus UNLIMITED snacks and drinks throughout the day and this includes alcoholic beverages! 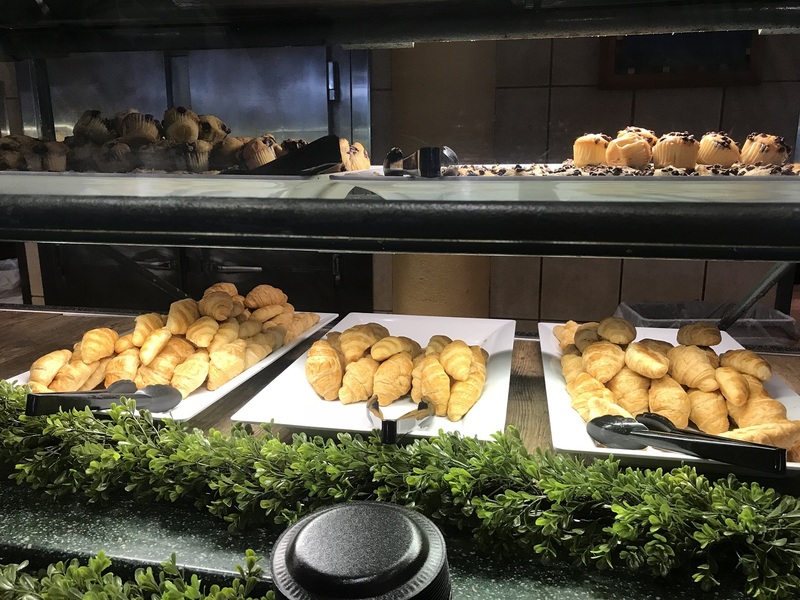 Start the day with a hot breakfast and enjoy tasty dishes like sweet Hawaiian chicken, BBQ pulled pork, cobb salad, chicken tenders, pasta and fresh fish for lunch. If you’re feeling hungry during the day, you’ll find snacks like crisps, warm pretzels, cookies and fruit. When it comes to all-inclusive at Discovery Cove, that doesn’t just mean food and drink. There are lots of other things included too. 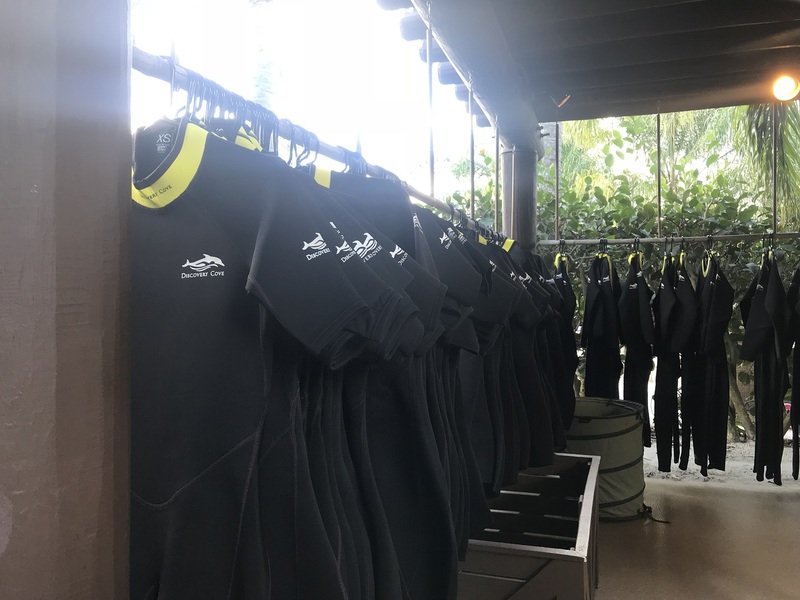 Your admission to Discovery Cove also includes locker hire, towels, wetsuits, a souvenir snorkel, mask, shower amenities and free parking. You’ll also be provided with an animal-friendly sun cream, that is safe to wear in the animal habitats, so it’s important that you don’t bring your own. Discovery Cove is an amazing place to visit, but if you want to make your day even more memorable there are a host of amazing add on experiences to enjoy like swimming with dolphins, feeding the rays and learning how to be a trainer for the day. These come at an additional cost but are well worth it. SeaVenture is one of our favourite things to do at Discovery Cove. This incredible experience is an underwater walking tour that lets you walk beneath the surface of the Grand Reef surrounded by thousands of beautiful sea creatures. If you have a GoPro it’s a great idea to bring it with you to Discovery Cove. 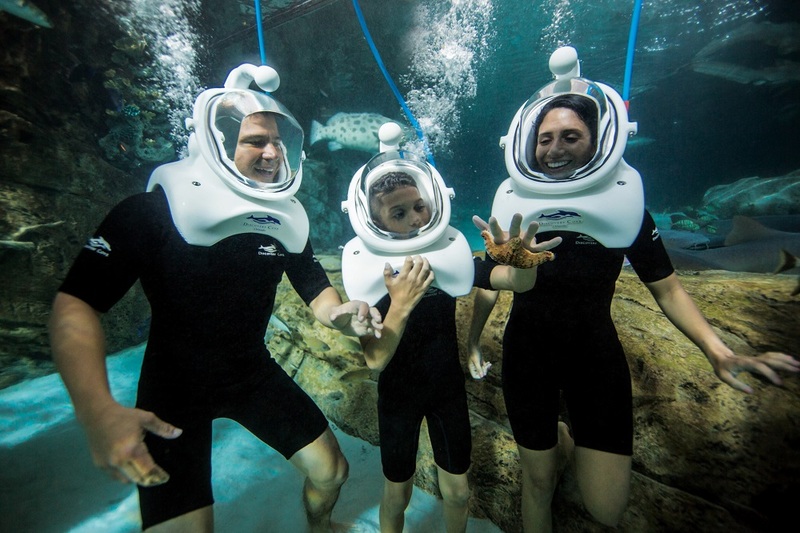 You’ll be able to capture incredible underwater moments that you can cherish forever. You can use your own camera in most locations throughout the park, except for the Dolphin Lagoon and Shark Swim. This is the place to go to get up close to some of the amazing animals that call this place home. You’ll be able to have your photo taken with birds, armadillos and sloths to name just a few. When you arrive at Discovery Cove, find out what time these furry friends will be making an appearance, so you don’t miss it. This is something that the kids and big kids will love. When you visit Discovery Cove it’s a good idea to pack light. Lockers are provided, so you can store your belongings safely for free, but you don’t want to keep going back and forth to the locker when you could be relaxing on the beach. That’s why we’d recommend packing light and just bringing the essentials. Did you know, that your Discovery Cove tickets also include 14-days consecutive admission to SeaWorld Orlando and Aquatica? 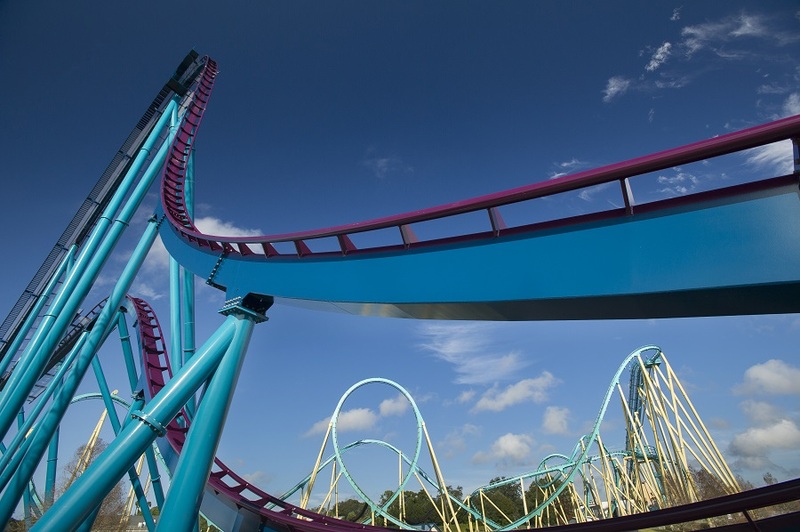 SeaWorld Orlando is home to some of the most thrilling coasters in Orlando and has lots of amazing animal encounters, while Aquatica has plenty of fun water slides. Make sure you have enough time to visit them all. We’d strongly recommend not wearing any jewellery to Discovery Cove for two reasons. The first being that you don’t want to lose it on the beach and the second reason is that there are lots of areas where you aren’t allowed to wear jewellery. If you’re planning on taking part in an experience where there are animals, you won’t be allowed to wear jewellery for their safety, so it’s best to just leave it behind somewhere safe or put it in your locker when you arrive. Ready to start planning your visit? Click here, to view our range of Discovery Cove tickets.